Are you still deciding where to go your loved one, family, friends, or work colleagues for Christmas and New Year’s in London? Perhaps Bronte restaurant could be the one? This restaurant located next to Trafalgar Square. Featuring a private dining room and also upstairs mezzanine area. The venue is certainly fit for a duke with a stunning interior design by famed designer Tom Dixon. Dixon brings a stylish and sophisticated interior to the restaurant which has a wide-open terrace at the front leading into the well-lit and spacious entrance with an array of plants. With a stunning voluminous terrace covered in cherry blossoms which will sweep you off your feet, the floor to ceiling glass entrance allows diners to peek into a gilded pink and teal vintage interior. 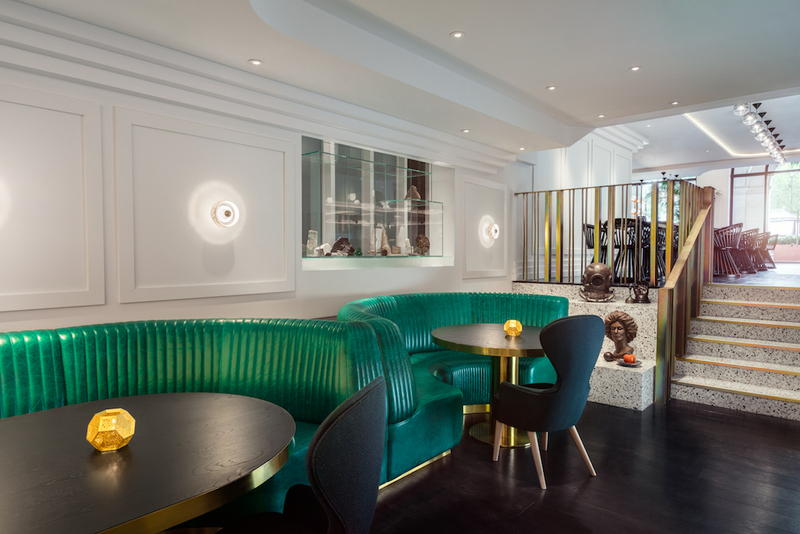 Golden birdcages filled with flamboyant canary yellow feathers, eclectic lampshades, and a baby pink bar designed by famed designer Tom Dixon, making this place suitable for an instagram moment. Bronte also features a dining area for more intimate occasions with pale pink curved seats surrounded by glass-mirrored cabinets. Perfect for entertaining an evening of small or large groups. The timeless dining room impresses on entrance with low-rise pink chairs and a fantastically artistic design with Chinese ceramic faces adorning the interior. The bright rooms are given a soft pastel shade the perfect vibrancy to enjoy breakfast, brunch, lunch or dinner with your party, whether it be an intimate occasion or group outing. Serving up a delicious twist on contemporary pan Asian cuisine; the menu will surprise you as our rare presentation and kink will have you nibbling on signature dishes like soft shell crab bao buns, tuna tataki tostadas, drunkin shrimp, fudging fortune cookie and other surprises. We’ve kept some of your favorites on the menu like Chicken Gyoza, fresh Sashimi, iTempura Prawn & Wagyu Beef Maki as well as Yellowtails Sashimi & Jalapeno. But not to worry our menu offers something for everyone you will have to taste for yourself. With an all day menu offering a range of classics to contemporary, customers can expect a breakfast menu with classics such as salmon & scrambled eggs and smashed avocado & poached egg and the classic burger. Bronte Restaurant, Grand Buildings, 1-3 Strand, London WC2N 5EH.